The Royal Canadian Mint announced a special set of coins that would be circulated this year to celebrate Canada's 150th birthday. The standout coin is definitely the toonie which glows in the dark! Named "Dance of the Spirits," the gorgeous design was submitted by Dr. Timothy Hsia from Richmond, B.C. and his lawyer brother, who both happen to do artwork "in their spare time," reported CBC News. 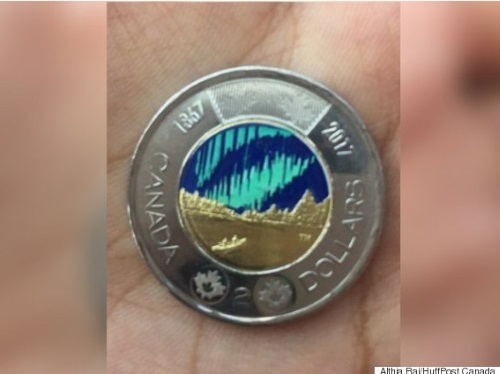 The coin was coloured using the mint's new "new pad-printed process and a new ink formulation containing luminescent material," mint spokesman Alex Reeves told HuffPost Canada. About three million of the toonies have been made for general circulation, and you'll see them eventually as banks replenish their coin inventory, explained Reeves. You can look for these coins in your change, or buy the full set of the Canada 150 coins yourself at a Royal Canadian Mint boutique in Ottawa, Winnipeg or Vancouver or Mint online. Click here for the news article on Huffington Post.